As part of the playing fields project, we have undertaken a new tree planting project. 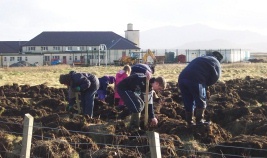 We have planted trees before, using the mound technique, at a site next to Rubha Chlachainn. These trees are doing extremely well. In February 2007 we had a weekend of bright sunshine and light breezes, first for a school tree planting day, and then for the community tree planting day the next day. The school pupils planted 270 trees in 45 minutes, managing to get wetter and muddier than any of us had anticipated! The following day, the youth club and community volunteers all came along to plant trees, and we managed to plant another 600 trees in under an hour. After a welcome cup of tea and lots of biscuits, we left George the Janitor trying to remove the mud from the school. We are very grateful indeed to the school, the youth club, and George the janitor, for making it all go so smoothly. We are also extremely grateful to J J MacDonald and Iain MacDonald for donating their time, to dig the planting holes for the trees. This work accomplished more than we could have ever managed by hand, and it would have been a thankless job, with the overgrown state of the land, and the heavy heavy rain turning everything into such a bog. Moran Taing to you both! In the future, exploration paths through the trees will allow pupils at the school to gain real practical experience of ecology, biology, and other investigative projects. The idea for the paths came from watching how children already use the open space, developing pathways to explore, to reach special areas, to follow along, and to chase each other.